If current trends continue, the 2010s could be forever known as the decade of the no-hitter and the perfect game. At the 2010s midway point, baseball fans have already witnessed 24 no-hitters, five of which were perfect games. The 1960s hold the current no-no record with 34, and pitchers need to throw just two per season to match the mark. 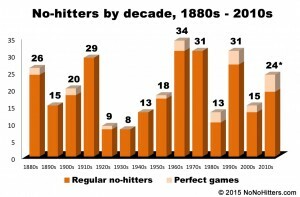 The 2010s already broke the record for perfect games, which had been held by the 1990s. As seen on the bar chart above (click on the image for a larger view), no-hitters seem to come in cycles, so we could be poised for a drought. Major League Baseball experienced its last dry year in 2005, and perhaps the baseball gods are looking to celebrate an anniversary. Or, pitchers could continue to dominate and drive our count closer to 300.